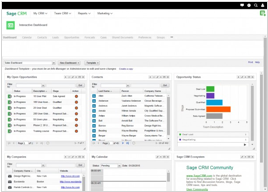 Whether you’re a salesperson, support rep, manager, or VP, the interactive dashboards in Sage CRM can be a really important tool in helping you leverage CRM data most effectively. In this article, we’ll take a look at how to use and customize these powerful dashboards. 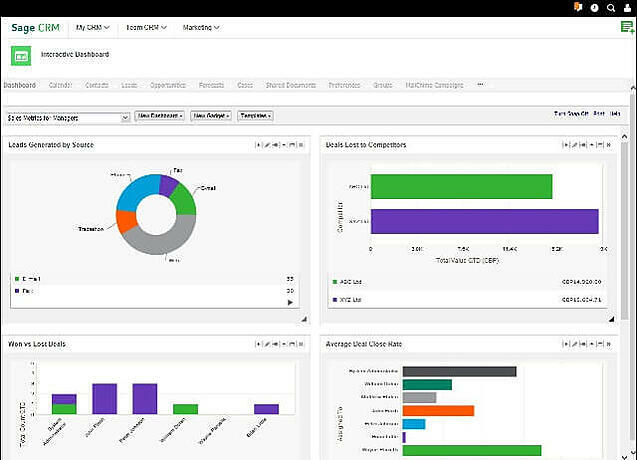 An interactive dashboard is a highly-customizable workspace that allows you to control and personalize the CRM data that displays onscreen. In short, it provides a snapshot of the CRM information and tasks you use most often so you have quick access and can be effective in your job. You can create multiple dashboards by either starting with an existing pre-defined template (like sales, management, or support dashboards) or create your own new and unique dashboard layout. Each dashboard contains a collection of individual gadgets that can display feeds, workflows, and actions that you want to drive from your personalized workspace. You drag and drop these gadgets onto your dashboard to create the customized data display and layout you want. Standard gadgets are available for things like your calendar and appointments, sales opportunities, support cases, important customer contacts, and more. Not only do these gadgets feed information from Sage CRM, they can also pull information from external websites and even back office accounting data from your Sage 300 system. You can edit gadget properties and you can even perform tasks from some of them, such as logging a new case or advancing a sales opportunity to the next step. Click below to get in touch if you need some help setting up, using, or customizing your Sage CRM Interactive Dashboards.